On the outskirts of Hamilton, Twigs Florist is located in the tranquil community of Tamahere, and proud to service the region�s homes, businesses, and public institutions such as schools, hospitals, aged and assisted care facilities, along with cemeteries and funeral services. The rural town of Tamahere is not only rich in history and culture, but a drawcard for a growing community based on its rural-living lifestyle and the major city of Hamilton close by. Tamahere�s blossoming population is evident in the major road links to the town, along with its impressive horticultural trade, quaint charm and bourgeoning local businesses. Just a short 10 kilometre distance from the city of Hamilton, Twigs Florist covers a broad range of delivery localities in places of worship and churches. Some of which include Carmel Malayalam Pentecostal Assembly Of God, HamSouth Baptist Church, Church of Jesus Christ of Latter Day Saints, St Pius X, Good News Baptist Church, Saint Matthew's Catholic Church, Hamilton Seventh-day Adventist Church, St Andrews Presbyterian Church, Gateway Church and the Hamilton New Zealand Temple among many others. Twigs Florist can also assist with a sincere arrangement that relays your condolences throughout the Tamahere and Hamilton area, and service cemeteries, crematoriums and funeral homes, including Pellows Funeral Directors, Seddon Park Funeral Home, James R Hill, Simplicity Bereavement Services, Woolertons' Funeral Home, Simply Cremations and Ormsby Family Funerals, as well as Hautapu Cemetery, Hamilton West Cemetery and Hamilton Park Cemetery. 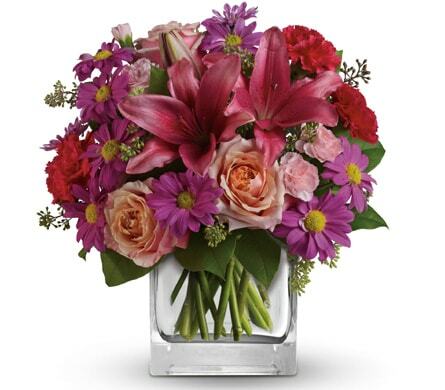 The perfect way to wish an acquaintance, friend or family member a speedy recovery, or to let them know they�re not far from your thoughts is to send a cheerful bouquet. Some of the hospitals and aged-assisted living communities we deliver to are the Tamahere Healing Centre, Waikato Hospital, Atawhai Assisi Home & Hospital, Bupa Rossendale Dementia Care Home, Henry Rongomau Bennett Centre, along with the Radius Kensington Rest Home and Radius Windsor Court Rest Home, Dementia Unit and Retirement Village, Tamahere Eventide Home & Village and Cascades Hamilton. 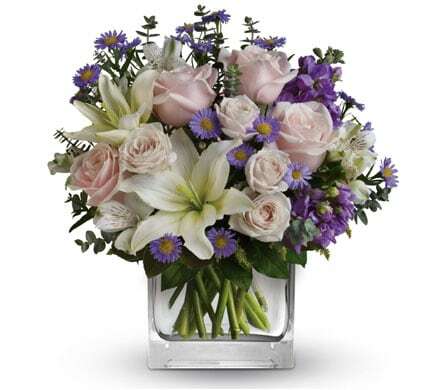 Floral artwork not only inspires beauty, but embraces an individual with the sentiment you intend. 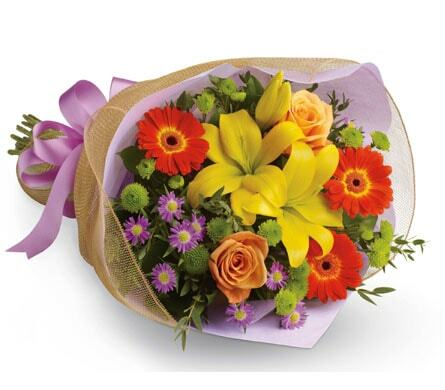 The feeling of surprising a loved one with a gorgeous bloom can envelop the soul like a soft summer breeze. Designed to captivate the heart and senses, our �Enchanted Garden� arrangement lives up to its magical name. This spellbinding fusion of peach roses, pink lilies, and purple daisies are blended together to create a wondrous sight for the eyes, and rainbow imprint on the heart. There doesn�t have to be an occasion to send our �Basket of Sunshine�, yet with this eye-catching array of buttery-yellow roses, gerberas, daisies and alstroemeria, you�ll brighten your loved one�s special day, anniversary, celebration, or simply �just because� they deserve it.